This dietary supplement has been specifically formulated to offer a concentrate of catalase, an enzyme present in most living organisms and the subject of numerous scientific studies in recent years. Catalase has a significant anti-ageing effect, primarily helping to prevent hair from turning grey prematurely. 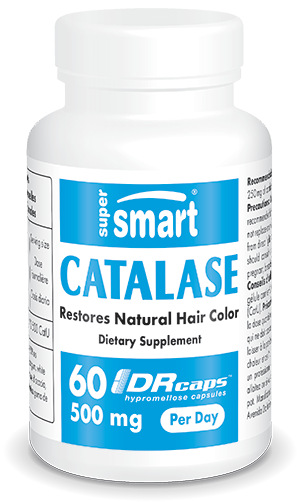 Catalase’s efficacy may be linked to its very specific chemical composition. It is in fact a large protein formed from four identical chains of amino acids, each chain containing an atom of iron called a haem. This specific structure means that catalase can produce almost 200,000 catalytic reactions per second. It is thus considered one of the most active enzymes.